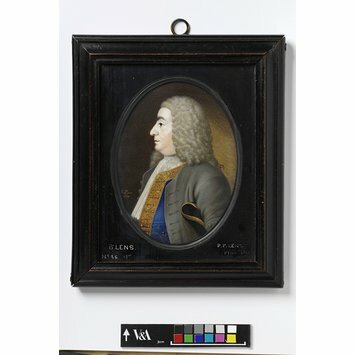 Oval watercolour on ivory portrait miniature of Bernard Lens, the father of the artist, portrayed in profile wearing a fine cobalt blue and gold jacket topped by a collarless grey jacket with wide button holes, with a hat tucked under his arm. His hair is long, wavy and grey and the signiature of the artist and date appears in front of the sitter's chest. Signed and dated on the front 'P. P. Lens / 1734'. 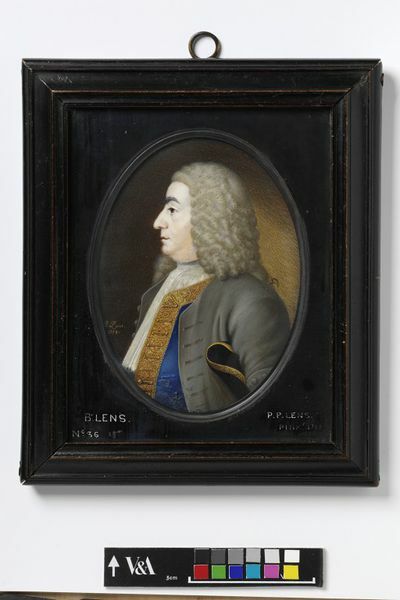 Portrait miniature of Bernard Lens, father of the artist, dated 1734, watercolour on ivory, painted by Peter Paul Lens (1714?-1750).